Do You Know What’s Missing From Your Bottled Water? BCS Pure Water adds electrolytes and minerals to our water! Bottled water and even standard reverse osmosis systems simply provide basic acidic water by stripping ALL the things they find in your water. We put back all the good things, like electrolytes, 20 essential minerals. Does your water have that? Known for centuries to be able to restructure water by providing an electrical (FIR) charge to water. The structured water is able to be absorbed in the cells and realize superior hydration. It also contributes to an increase in water alkalinity and supports an increase in metabolism, healing, immunity and is known to decrease chances of getting dementia. Hematite is an iron oxide mineral with a very high iron content and has been used for centuries for the healing of blood disorders. The high iron content allows it to provide a regeneration to body cells to assist in faster healing and recovery time from illness and surgery and is used to improve anemia and to regenerate the skin. It supports the immune system and is very good at improving energy levels. Tourmaline has been referred to as the miracle stone that generates electricity in water. This electricity provides a far infra-red capacity that generates negative ions that helps to “uncluster” the water molecules and increase the absorption properties of water at the cellular level. Negative ions help to regulate the human body ion balance, assist in physical and mental relaxation, activate the cells, and improve the recovery rate. Negative ions also control the oxidation of the body. In today’s environment, many factors can produce positive ions, which cause tension for the body, making negative ions essential. Tourmaline emits many essential minerals: K, Ca, Mg, Mn, Sr, Zn, Ba, Cr, V, Ni, Co, Cu, Fe, Al, Na, H2SiO3, AG, P, La, CE, Nb. Zeolite is a mineral found in sea salt and provides an immune-detox to help prevent illness. It absorbs toxins, free radicals and metals and eliminates them from the body. The honeycomb-like structure provides a high affinity for trapping heavy metals, PCB’s and other harmful metals and toxins. Due to the small size of the zeolite particles and its absorption capacities, it is able to bond with waste products and toxins to eliminate from the body. Zeolite has a unique ion exchange capacity and provides a high level of immune support and has been used to assist chemotherapy patients in order to re-establish their immune system. Its purification ability in combination with silver ions is FDA approved and its health benefits lend to the support of health including cancer and neurological disorders, such as Alzheimer’s, autism and dementia. Silver ions are one of the most potent antimicrobials available. A naturally occurring element, silver has long been used as an antimicrobial; as early as 79 AD in Egypt it was used in long-term water storage and today is used in medical devices and facilities as an antimicrobial. In conjunction with zeolite that serves as the carrier silver ions control over 450 forms of viruses. Hydroxyapatite is a “bone-building” supplement with superior absorption in comparison to calcium. It is the chief structural element in vertebrae bone. It is the principal storage form of calcium and phosphorus in bones. Promotes ion exchange and provides negative ions and increases solubility in water. It is known to reduce bone loss and assist in the healing process. Enhances the benefits of calcium. Activates the molecules to provide FIR benefits of increased absorption. Contributes minerals such as: Calcium, Magnesium, Potassium, Sodium, Phosphorous and Zinc. Zeo-Z1 is comprised of natural zeolite and calcinated calcium. The calcinated calcium is derived from the shells of oysters in Japan. In 1992 a food poisoning outbreak called Enterohaemorrhagic hit Japan and was controlled and eliminated by this sterilization method. Provides an extremely effective germicidal for the removal of bacteria in water. Also provides high-grade calcium that is necessary for good bone and heart health. Why Is Our Water Better? MINERALS! Bottled water and even standard reverse osmosis systems simply provide basic acidic water by stripping ALL the things they find in your water. We put back all the good things, like electrolytes, 20 essential minerals. Does your water have that? BCS Pure Water not only removes all of the contaminants from the water, we add back pH balancing electrolytes and minerals making a water for wellness! 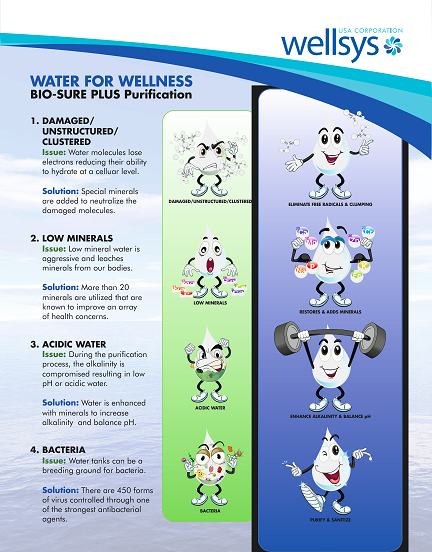 BCS Pure Water has a nine-stage filtration process that removes the contaminants and adds back healthy electrolytes and minerals to make the best water for wellness! 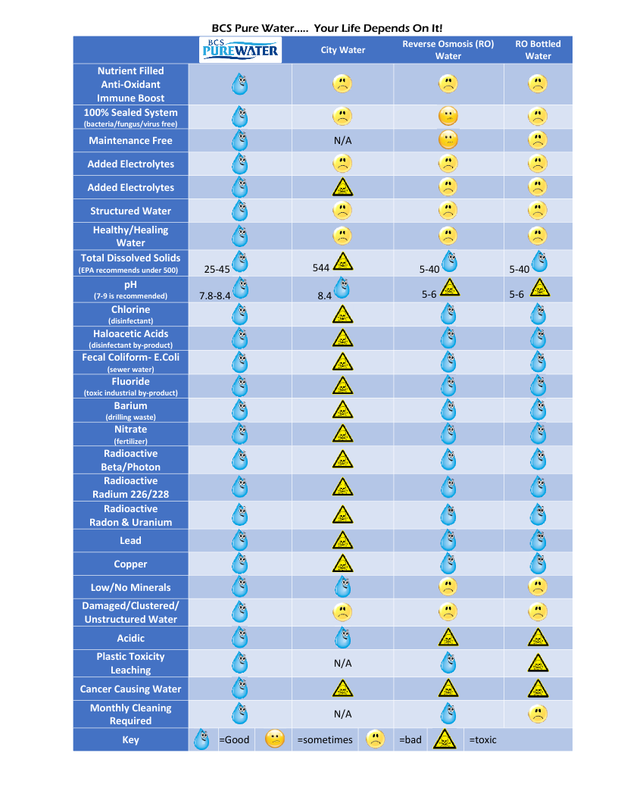 BCS Pure Water removes all of the contaminants from the water down to .0001 of a micron!